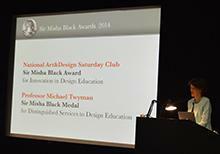 The Awards Ceremony for the 2014 Sir Misha Black Awards took place on Wednesday 7 May at the Royal College of Art, London. “Welcome Rector Paul Thompson, Professor Twyman, Sir John and Lady Sorrell, Oliver Black, and Mrs Black, Distinguished Guests, members of the Founding Bodies, Patrons, ladies and gentleman, students of the RCA and members of the National Art&Design Saturday Club – Good Evening! Welcome to the Ceremony which celebrates the 36th year of the Sir Misha Black Awards and the 2014 Medal for Distinguished Services to Design Education. My name is Mary Mullin and on behalf of my colleagues on the Awards Committee: Professor James Randle, representing the Royal Academy of Engineering; Professor Sir Christopher Frayling representing the College of Medallists; Professor Malcolm Garrett, representing the Royal Designers for Industry and Joe Kerr representing this distinguished institution, the Royal College of Art; thank you for being with us. My job tonight is to tell you a little about Sir Misha Black and the Awards and to introduce the speakers. Each and every Awards Ceremony since the first, held in Buckingham Palace in 1978, has its own special character. Tonight is no exception and has new and exciting elements. For the first time, it is possible to look at the Awards in a span of almost 200 years! How can this be? Well, if , two years before the start of World War One, in 1912, a brave young couple had not fled pre revolutionary Russia to work in London, bringing with them their two year old son Misha, we would not be gathered here this evening. In 1959 Misha, became the first Professor of Industrial Design at this Royal College of Art and as Sir Misha held the position here at the Royal College until his retirement in 1975. It is fitting that we should gather in this building where he spent so many years and inspired generations of students. He was in the vanguard of those who encouraged collaboration in design education, by introducing subjects such as engineering and management studies into the industrial design course at the RCA. Sir Misha died in 1977. The organisations to which he had given so much met, and agreed, that the most fitting tribute to his life and work was to recognise the vital role of teachers of design, by establishing The Sir Misha Black Medal for Distinguished Services to Design Education. In 1996 the Royal Academy of Engineering joined in the Awards in recognition of the pioneering work of Sir Misha in encouraging design studies in university engineering courses. They struck a Medal, an exact casting of which you will see in a few moments, and thus began the tradition which we are continuing tonight. My committee has always had the hope, that this tradition would continue through this century and into the next. Hence our 200 year perspective. This optimism is triggered by the fact that, The Award for Innovation in Design Education will go tonight to The Sorrell Foundation. It has re-ignited the fire under the Art&Design Saturday Club, the Members of which age between 14 and 16 years. Looking at the encouragement and support that these young people are being given and what they are achieving I have no doubt that in 50 or 60 years from now one of the teenagers, who now attends a Saturday Club, will be standing on this, or some other platform, handing out the 100th Sir Misha Black Medal. Perhaps, to one of his or her colleagues who also attended a Saturday Art&Design Club and went on to give distinguished services to design education! This is the continuum which we hope will stretch from Russia in the early years of the 20th century, through to Britain and the rest of the world into the 22nd Century. “So now to this the 36th year and the presentation of the 26th Medal (Medals have not been awarded every year but only when truly deserved). As we gather to honour Professor Michael Twyman we recall past recipients of the Medal – the photographs of these distinguished design educators grace the wall of this theatre and in this way, they are very much part of our celebrations this evening. Collectively, they represent the highest achievement in design education in the 20th Century and for these early years of the 21st Century. Tonight I would ask you to remember particularly Professor Frank Height who died at the age of 91 last July. Professor Height was much more than a highly respected Medallist. Without him there would not be the Sir Misha Black Awards. Frank Height taught here in this Royal College with Sir Misha and when Sir Misha retired in 1975 Frank Height took his place and remained at the College as Professor of Industrial Design until his own retirement in 1986. Professor Height was one of those responsible for founding the Medal in honour of his colleague and for bringing it under the wing of the Royal College in 1988. He was the rock on which the present Awards programme was built and the voice of wisdom and integrity on the committee. Even when no longer well enough to travel to meetings he remained as special adviser to us, until his death. More than 35 years of service. He was a true teacher who always put the interests of his pupils first. His quite, calm and courtly demeanour hid a man constantly innovating, evolving, breaking new ground and always looking to the future. He was responsible for establishing the links between this college and the schools of engineering in Imperial College, In 1967 with Misha Black, he founded, here at the RCA, what is now recognised as the best automobile design course in the world. In 1971 he brought the first ever group of international designers to work in the then USSR. They were joined in Minsk by a similar group of Soviet designers and together produced designs for bread making and delivery systems and street furniture. This was a ground breaking exercise in diplomacy – never mind design! He built special links with Japan, India and Ireland and was held in the highest regard in these countries. And so much more. Our committee will always miss him. We have agreed that the best way we can honour him is to work harder to ensure that these Awards, to which he had given so much, would grow in depth and breadth. It is a great honour for us to welcome his son David here this evening. And, as we pause to remember Professor Height with respect and affection I would also ask you to remember Professor Yuri Soloviev, the 2001 Medallist who died in Moscow last October at the age of 93. He and Professor Height had collaborated on that famous design gathering in Minsk in 1971 and remained colleagues and in touch to the end. Yuri Soloviev was a remarkable man and the only way I could ever describe him and his ability to negotiate his way through the old Soviet system as head of VNITTE, the All Soviet Design Institute, become President of the International Council of Societies of Industrial Design, survive the various regimes in the USSR and then become a member of Parliament in Gorbachov’s post-communist government, was, as a man who could walk on a field of eggshells without cracking one! It was an education to know him and a privilege to welcome him to the College of Medallists. We realise with his passing that the world is a much less colourful and indeed, it could be said, a less courageous place. May these pioneering, far seeing educators who gave so much to others, rest in peace. “The Award for Innovation in Design Education was inaugurated in 1999 to ‘recognise a person who, or a team which, has made an innovative move, clearly demonstrating that the education of designers has been measurably improved and the profile of design education raised’. This Award is made only when these demanding criteria are reached. This year the Award is made to The Sorrell Foundation, to be accepted by Sir John and Lady Sorrell, and here to honour them are previous Award winners whom we welcome: Dr. Paul Ewing, Professor Jane McCann, Professor David Crow, Professor Adrian Forty and Professor Lorraine Gamman. “When this Medal in honour of Sir Misha Black was established in 1978 the world was a very different place. Fax machines were not in common use until the 1980s, (and now indeed rarely used). It was in 1982, at a cost of $8,000 that Bill Moggeridge, an RDI, who founded IDEO, a patron of these Awards, put his ‘Grid’, the very first laptop, on sale. And pioneering testing of mobile phones only began in 1983. Since1960 Professor Michael Twyman has steered educational programmes through successive waves of ever evolving methods of communication. Whatever the technology, alphabets and numbers have been and remain the basis of all communication, whether scratched with chalk on slate in the earliest classrooms or texted, tweeted or sent by electronic mail today. They are the symbols of communication. Professor Twyman has been imbuing successive generations of international students with a respect for letters and numbers, as a foundation for the creative, innovative, and as yet undreamed of, ways they will be used in a sustainable, modern, global communication network. Nevertheless Professor Twyman is the man who made the CASE (upper, of course,!) against Disraeli by LEADING the world in making typography a university course. He JUSTIFIED this when he combined intellectual and practical work into, what he described as, ‘design for reading’ and CENTERED his work in Reading (correct pronunciation, of course, READING University). His career has been BOLD yet MEASURED, fully JUSTIFIED, neither RANGED LEFT or RANGED RIGHT. Certainly with more ASCENDERS than DESCENDERS. He has added courses and degrees and archives, each perfect of its TYPE, none at random but placed in a perfect GRID, so well designed that not a single element ended in the GUTTER! “Professor Michael Twyman, I invite you to step forward and accept the 2014 Sir Misha Black Medal for Distinguished Services to Design Education. ‘I may, without vanity, hint though an angel should write, still ’tis devils must print’.